All right! So I took a van from Kuta, to go to Ubud, and the least we can say is that Ubud is really quiet. So quiet compared to Kuta. It’s surprising, usually the cities next to the sea are relaxing, and the ones on the mainland are more lively. This time it’s clearly the other way around. There’s no beach in Ubud but the place is relaxing. No noise pollution, no drunk backpackers, no street with 50 very loud bars next to one another. That’s cool! Ubud, that’s the Bali I wanted to see! Once again, the cost of living is very low! The food is good. The locals are relaxed and live their lives. A lot of them greet me in the street. 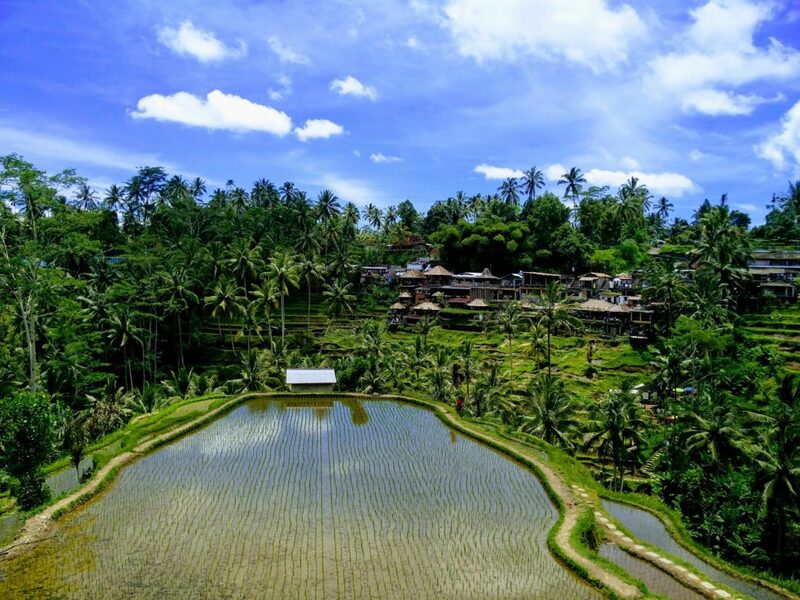 Ubud is also a place with wonderful landscapes : you cannot miss the rice fields stretching as far as the eye can see. But also all the beautiful temples there, and the monkeys wandering around, especially in the sacred monkey forest. There are restaurants serving local food all over the place, an art market, etc… And Ubud is a paradise for those into yoga! There are yoga classes everywhere in the town! It reminded me a bit of Luang Prabang in Laos! Every evening in Ubud, there’s a Balinese dance show. In fact, there are many shows all over the area. In some cases, you have to pay to attend the show, in other cases it’s free. Actually there are several types of Balinese dance : Barong, Topeng, Jegog, Janger, Tek Tok… Unfortunately, I didn’t have the opportunity to attend a Balinese dance show, I heard about them during my last day in Ubud and I was busy… Anyway, since Ubud is a lovely little town, I decided to rent a bicycle to explore Ubud and the surroundings! Several tourists didn’t dare to go there because they’re afraid, however it’s the main tourist attraction of Ubud : the sacred monkey forest. A forest in the heart of the city where hundreds of monkeys live in total freedom. Some of them are wandering around the forest, others sleep, sometimes they play, they run all over the place, they make noise… The monkeys there are not thiefs like the ones in the mount Popa in Myanmar. A monkey came up to me, jumped on my shoulder, and tried to open my bag. Do not panic, after some time, they just leave. The monkeys were not aggressive with me, I even found they were nice. But later on the road, on top of Mount Kelimutu, I met an American girl who told me a monkey bit her face in this forest! She also told me “That same day, another monkey bit a 7-year-old girl’s index“. Apparently there are various bites several times per week but they don’t talk about it to not scare the tourists off (the forest brings them a lot of money!). Do not leave home without a travel insurance! It’s 50k rupees (3 euros) to get in. In the south of Ubud, do not miss Tegenungan Waterfall, a wonderful waterfall! Around the waterfall, you’ll see a few shops selling souvenirs and local art, some restaurants, otherwise just admire the view, it’s impressive! It’s 15k rupees to get in (one euro). You can get on top of the waterfall (blangsinga waterfalls). You’ll have to pay an extra 10k rupees (0.60€) to get there. Another place you cannot miss in Ubud : Tegallalang Rice Terrace, the rice fields you have to see in Ubud! Tegallalang Rice Terrace is located 10 kilometers (6 miles) north of Ubud, and those rice fields are wonderful! It’s also possible to have a walk in the middle of the rice fields, but in some areas, the locals will ask for a donation. It’s reaaally hot there, come early to avoid the scorching heat and the crowd. And don’t forget to bring water! If you can, you should see a famous Hindu temple : Puri Saren Agung, also called Ubud Palace. It was the official residence of the royal family of Ubud. Unfortunately, the palace was under construction when I was there, so we couldn’t get in. I decided to go to see another place just opposite to Ubud Palace called Saraswati Temple. This one is also beautiful, and it’s free to get in. There are other things to see in Ubud. You’re into art? Go to the Blanco Renaissance Museum, dedicated to Antonio Blanco, a painter who lived in Ubud for a long time. You can also enjoy Campuhan Ridge Walk. It’s an enjoyable walk, 2 kilometers long, where you can admire several rice fields. Some locals go jogging there (be careful, there are a few slopes!). Ubud is a small litlle town you cannot miss if you go to Bali. We’re far from the hustle and bustle of Kuta, and the town is enjoyable. A must see! From Kuta, I paid 50k rupees (3 euros) my 2-hour-ride by van. You won’t escape from Nasi Goreng, Indonesia’s signature dish : rice, egg, chicken and shrimps. By the way here’s an article about the best Indonesian food to try. The laughing buddha bar is a nice place to have a drink! One day I will make it to Bali! I would love to see Tegallalang terraces, the temples and swing into the sky! Thank you for sharing as it only strengthens my wanderlust to visit! I loved Ubud! Relaxing and beautiful! You should definitely go if you can! It looks so unbelievably breathtaking, wow!! !